For well over a decade, Today’s Dietitian magazine has been a trusted resource for registered dietitians and nutrition professionals. As a well-regarded and trustworthy industry publication, Today’s Dietitian is also one of the most effective vehicles for recruiting the best professional talent in the field of nutrition and dietetics. With thousands of qualified professionals reading our publication each month, Today’s Dietitian offers recruiters an audience of both active and passive job seekers to whom they can present their current opportunities. 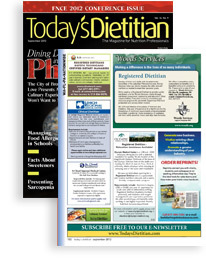 A valuable asset to any recruitment campaign, each print issue of Today’s Dietitian offers double exposure through our digital companion, which is posted each month on this website. Post your resume to be viewed by potential employers. Set up your own job agent to automatically send you e-mails of matching jobs according to your predefined search criteria. Search through more jobs than ever before. Place your ad today and take advantage of real-time job posting capabilities! Now you have the opportunity to post jobs within minutes or search through a résumé database of nutrition job seekers from across the United States. It’s the most effective and efficient way to recruit qualified candidates.